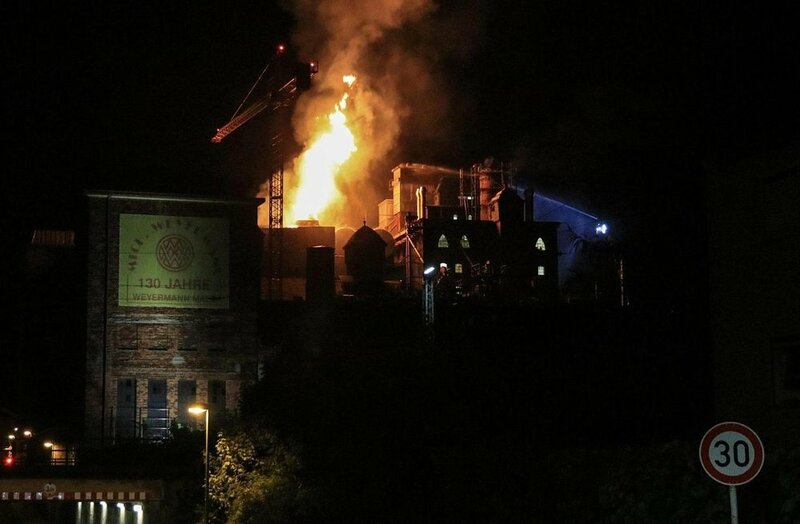 A large fire that broke out in the early morning hours of August 10 destroyed part of the grain drying operations of venerated maltster Weyermann in Bamberg, Southern Germany. Only hours later did emergency responders gain the upper hand over the towering flames. Fourth generation factory owner Sabine Weyermann, a pre-eminent ambassador for craft beer, was traveling here in CA when disaster struck and immediately hurried home to Bamberg. Yet, in a brief chat with Two Coast CEO Jan Dreier this morning she had relatively good news to report. One of Weyermann's historic buildings was severely damaged, yet only one of four kilns was rendered inoperable. Production resumed that very morning. Despite being housed in lovingly restored buildings of some historical relevance Weyermann is one of the global leaders in brewing malt production and one of the most technologically advanced factories in the field. We are glad no one was hurt and we wish the Weyermann family and their employees nothing but the best while they rebuild their operations. Roger Kunsemueller June 27, 2018 Two Coast Brewing Co.